The Paasche Model H Airbrush Set includes everything you need to hook up to a compressor. It features the H-Series single-action airbrush, which is ideal for craft, hobby, models, automotive, and T-shirt applications. 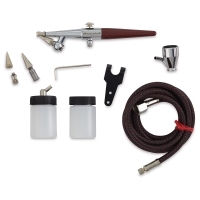 The airbrush is external mix and bottom (siphon) feed. It's easy to use and clean, making it great for artists new to airbrushing. 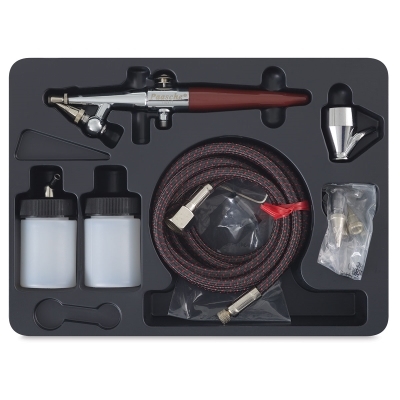 The set comes with different size tips, caps, and needle assemblies for a range of spraying techniques, plus tools and accessories. 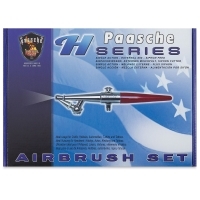 The H-Series Airbrush is made in the USA. For info on tip sizes, please see the Item Specs tab.